H.E. Governor Wycliffe Ambetsa Oparanya today condoled the family and friends of the late Mzee Nicholas Awino Opwora of Nyapwaka village, Namamali Ward Matungu sub county, Kakamega County. The late was a veteran politician during the KANU era together with the late local politician, Dr.Eliud Wameyo. H.E the Governor who was a close friend to the family of the late through him and his sons recalled how Mzee Opwora supported his bid for the gubernatorial seat both in 2013 and 2017 and vigorously campaigned for him. He eulogised him as a well connected individual, well known all over the county who used his position in the Council of Elders forum of Matungu Sub-County to positively transform the society. Governor Oparanya used the opportunity to thank the residents for electing him as their Governor during the last general election. He called on politicians to shun away from raising sugar related issues during funerals as the same can not be solved during such platforms. 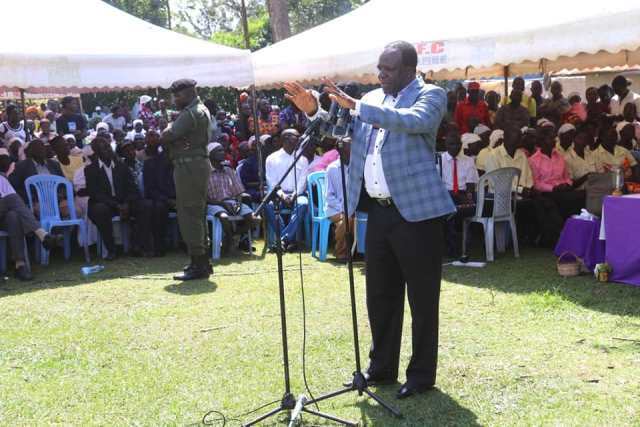 He reminded the mourners that him and other county bosses from the Lake Region bloc have already initiated talks with national government on revival of the region’s ailing sugar sector. On his quest for Presidency, Governor Oparanya stressed the need for other politicians from the Western region seeking the country’s top seat to respect his right to vie for the seat and also respect other leaders who might announce their candidature much later. “I urge my brothers from the Mulembe nation who are with me in this journey for Presidency to respect other leaders who have shown interest in this seat as well. When that time comes, wananchi will decide who amongst us will be fit enough to lead them,” he said. Later, H.E. the Governor joined family and friends at the funeral service of the late Mzee Sila Omeno of Ematsakha village, Marenyo-Shianda Ward. The late Mzee Omeno who died aged 85 years was a close friend and political supporter of H.E. the Governor. While there, the Governor also send his condolence message to the family of the late John Okoyana Oparanya of Mayoni ward, Matungu sub county. H.E. the Governor was represented at the funeral by County Secretary Madam Jacinta Aluoch Odhiambo. Other leaders who were present were Kakamega County Women Representative Hon. Elsie Muhanda, former Kakamega Senator Hon. Boni Khalwale, Lurambi MP Hon. Titus Khamala, former MP for Matungu constituency Hon. David Were, Members of County Assembly led by Majority Leader Hon. Joel Ongoro and County CECM for Finance and Treasury Geoffrey Omulayi among others. Elsewhere, Deputy Governor H.E. Philip Museve Kutima today attended the funeral service of Mzee Moses Omumia Litali at Ingotse, Butsotso North Ward, Lurambi sub county, Kakamega County. The deputy governor eulogised him as a hard working person who dedicated his entire adulthood to serve the people as a civil servant. He was also a talented footballer who turned up for several clubs in the country such as the then Abeingo FC and K.C.C Football Club in Naivasha.Prof. Kutima said his close working relation with H.E. Governor Wycliffe Ambetsa Oparanya has given him massive experience in service delivery and adequately prepared him to take over from the Governor after the end of the latter’s second term in office as Governor. He announced that the county government has already shown interest in tarmarcking the key Lurambi-Shikoti-Ingotse road that extends to Bungoma county and will continue pushing for a take over of that key road from the national government. The latter has listed it as a Class A road making it difficult for the county government to initiate its construction works. H.E. the deputy governor called on the residents to make informed choice of leaders when the time comes as the same determines how they will be governed.